number of practical issues relating to happiness, positive and negative consciousness, as well as the yoga itself. I am sure this book will be of interest and value not only to devotees of SriSri Ravi Shankar but also to all those around the world who are sincerely involved in the spiritual quest. As someone who has spent the last fifteen years on something of a voyage of spiritual discovery, I am always on the lookout for insights and perspectives that help me better define my own spiritual path. 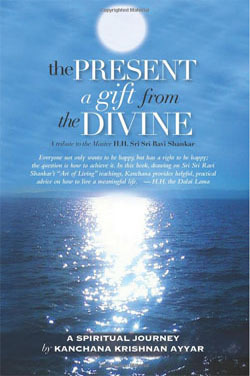 As such, when I was approached by Kanchana about giving my opinion of her latest book, The Present: A Gift from the Divine, I was hopeful I’d find another kindred spirit to share my journey with. Not surprisingly, I was not disappointed. Kanchana is one of those rare writers who manages to write from the heart using a straight-on approach uncommon in books of this nature. Her life experiences and willingness to talk to literally hundreds of people and hear their often painful and always informative personal stories attests to her dedication to furthering the cause of spiritual enlightenment and global awakening so vital to people today and for the world of tomorrow. While little in her writings are necessarily ground breaking, her perspectives are told in a way that manages to be both enlightening and entertaining, and should serve those seeking their own path to spiritual enlightenment well. What I found especially appealing about The Present: A Gift from the Divine: she is obviously a woman who heralds from an eastern background, yet possesses a keen awareness and innate understanding of how the western mind works. This allows her to bring eastern concepts to those who didn’t have the opportunity to grow up steeped in those traditions, further bridging the ever shrinking gap between east and west. While many of her ideas have been explored in the writings of Eckhart Tolle, Neale Donald Walsch and Wayne Dyer-among others-her unique voice infuses those ideas with a new vibrancy that many who are looking for a way to make sense of their life and its many challenges will appreciate. All-in-all, I found The Present: A Gift from the Divine, to be an important book that fits well on any bookshelf dedicated to spiritual growth, and a work I am only too happy to endorse. Best of luck to you, Kanchana, and may the present moment be your gift from the Divine. This book will be a link to connect for people looking for evidence of divinity. The Present: A gift from the Divine is a triumph of devotion and dedication. Stories in this book have come from all around the world and will serve as an inspiration for generations of seekers yet to come. I can envision someone reading this decades after it’s published, wondering how all the incidents are possible. What can I say? You had to be there. This one brief moment in this eternity of time, when someone extraordinary comes along and turns so many lives upside down. My regards to Kanchanaji – It’s been a long journey for her, and I know for sure this book deserves a place in any sincere seeker’s bookshelf. How does one practice being in the ‘present moment’? Kanchana Krishnan reflects on the experiences of seekers and teachers on the of the Art of Living spirituality path. This book shares personal experiences from ordinary people and how the path of spirituality has enriched their lives and those around them. Kanchanaji has beautifully shown how individuals from different cultures, background and religious traditions can be united through spirituality without conflict. She has peppered throughout the book personal spiritual insights from ordinary individuals that are relevant equally to both a novice and an experienced seeker. And that is what this whole book is about, lessons and experiences that are accessible and practical to the ordinary individual seeking spiritual knowledge. I have read the contents of book written by Ms. Kanchana Krishnan. I complement her for encasing Sri Sri Ravi Shankar’s wisdom and knowledge in such a simple manner. She has interviewed lots of people and by narrating the experiences of many people around the world, she has touched the core of human existence i.e. self. Once you start reading, you just get hooked and want to know how this pure, profound and deep knowledge has touched lives of millions of people around the world. Kanchana has put her heart and soul in providing us this wonderful piece of love in a small, sweetened and flavored capsule which is so easy to ingest and leaves us totally mesmerized. I wish that more and more people take the opportunity to read and assimilate Guruji’s knowledge as shared by our dear Kanchana ji. Jai Guru Dev. The few excerpts that I have read thus far make me want to read the rest. Wish you the very best in this exploration of the “idea of a Master” in our lives who acts as confidante, guide and a source of unconditional love, enthusiasm and wisdom. May the progress on the path continue. Kanchana’s devotion to bring her story to everyone has been a journey in the making! I am grateful to have witnessed the birth and growth of her dedication to reach out and touch the lives of many!